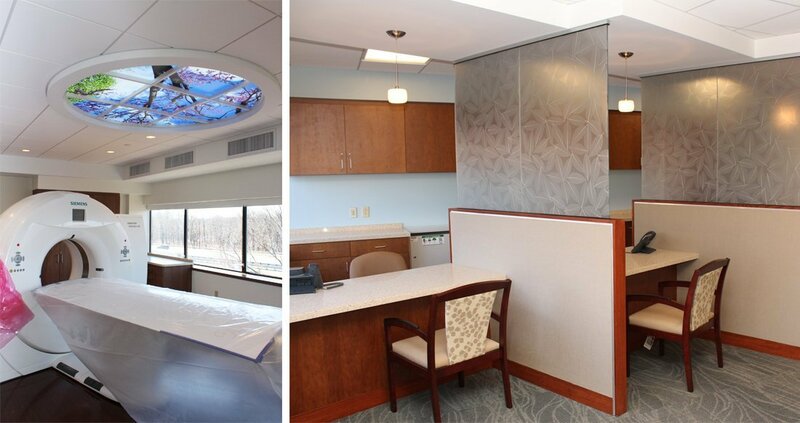 Cranshaw Construction performed the 41,530 SF, multiple floor build out for Winchester Hospital’s state-of-the-art Outpatient Center at 200 Unicorn Park. The Outpatient Center is home to comprehensive imaging services, a Breast Cancer Center, the Center for Healthy Living and a specimen collection site. The work included two new Magnetic Resonance Imaging (MRI) rooms using the latest technology. Other imaging equipment installed included new computed tomography (CT) scanning equipment as well as digital X-ray, fluoroscopy and ultrasound to support services such as digital mammography, breast ultrasound imaging and ultrasound guided breast biopsies, stereotactic breast biopsies, consultations with surgeons, oncologists and genetic risk assessments. Other major services available at this site include anticoagulation clinics, a diabetes center, pediatric asthma management, hypertension, chronic obstructive pulmonary disease assistance, congestive heart failure, pneumonia, myocardial infraction and osteoporosis. Integrative therapies include acupuncture, massage, hypnotherapy, Reiki, Tai Chi/Qi Gong and yoga also take place on site. The project was completed in 7 months. Cranshaw Construction is a general contracting and construction management company with practical design and construction experience. Founded in 1983, the company has successfully completed almost 20 million square feet of commercial space, totaling over $1 billion in the suburban Boston area in the last 31 years.